This section contains a complete guide to all our pages on the topic of Costa Almeria tourism and holidaying on the Costa Almeria. For a comprehensive list of all the tourist information pages please see the index further down the page. In this tourist guide to the Costa Almeria we help visitors who are planning a trip with useful and practical advice on many tourist related subjects such as comparing prices for renting a car, accommodation, sightseeing, weather, where to go, where to stay, travel information and what to see and do in the Costa Almeria. We also have photos, picture galleries, views, videos and webcams of the Costa Almeria so you can see what the various towns and cities of the Costa Almeria have to offer you for your holiday. These beaches have very clear waters ideal for scuba diving as pollution is low and they are usually not over-crowded unlike many beaches on other coasts such as the Costa del Sol or Costa Blanca. Popular towns and cities include Garrucha, Mojacar, Vera, El Ejido, Los Gallardos, Turre, Las Negras, San Jose, Aguadulce, Almeria, Roquetas de Mar, Viator, Adra, Benahadux, Albox, Almerimar, Carboneras, Aguilas and Cuevas del Almanzora. Many people are choosing to live in Costa Almeria due to the excellent all-year round weather conditions. Costa Almeria has the hottest climate in Spain. Temperatures will often hit 40 degrees Celsius in the summer months of July and August. While this may be too hot for some there are usually cooling sea breezes and the humidity is low making it a dry heat, therefore more bearable. The Spring and Autumn months on the Costa Almeria are wonderful months you can dine outside and do many activities due to the reliable weather. Most days are clear and sunny with little rainfall. The Costa Almeria is not only the hottest but also the driest region of Spain with much of its terrain desert. To the east there is the Sierra Nevada mountain region which includes Spain’s highest peak (Mulhacen at 3478 metres). Sierra Nevada is one of Spain’s very best ski resorts. Running along the south of this mountain range for 70 km are the valleys known as Las Alpujarras with the main town being Orgiva. This is a very scenic area and great for walking tours and holidays. This area is the setting for the well-known book ‘Driving Over Lemons’. 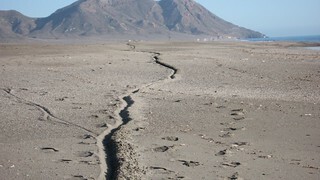 East of the city of Almeria is the famous Sierra del Cabo de Gata. This protected area is one of volcanic mountains with usual sharp peaks, crags and cliffs bordering the Mediterranean Sea. There are many hidden coves and beautiful sandy beaches. The waters are clear and great for diving and snorkelling. History lovers are best to visit the city of Almeria with its cathedral and imposing fortress the Alcazaba, which can be seen for miles around. Also the site of Los Millares north of Almeria towards the major towns of Gador and Santa Fe de Mondujar is worth a trip for people who enjoy archaeology. The site contains remains of tombs and walls thought to be from the first Spanish community of metalworkers dating back to 2700BC. As well as tourism the Costa Almeria is a major grower of vegetables, fruits and flowers. Usually the crops are covered with plastic sheeting which is a bit of an eyesore but has transformed this dry region into a major agricultural and economic force. Almeria International Airport now has many low-cost airlines flying into it which has really opened up the area to tourism and the owning of second-homes. You can fly to Almeria from London Gatwick, Luton, Birmingham and Manchester. The airport is 8 km from the city of Almeria. The nearest beach resort is Roquetas de Mar. Airlines that fly into Almeria International airport include: Adria Airways, Air Berlin, Air Comet, Air Europa, Air Nostrum, BMI Baby, EasyJet, Flightline, Jet2.com, Jetairfly, Luxair, Monarch Airlines and Ryanair. The Costa Almeria has a theme park called Mini-Hollywood. North of Benahadux near to Tabernas on the A-370 in the Tabernas Desert this was the setting for many of the famous spaghetti Westerns. The Clint Eastwood films (such as The Good, The Bad and The Ugly, A Fistful of Dollars) were shot here due to the low cost of filming compared to the USA. You can see the original sets and enjoy staged gunflights and shows. Costa Almeria is also growing in popularity due to the low property prices relative to the other Spanish Costa’s. Property prices are low because of the desert like terrain and climate of Almeria which has made for cheaper land prices as compared to other more populated areas of Spain. Many expats have bought property in the fast-growing urbanisations in or near the towns of Tabernas, Albox, Roquetas de Mar, Vera, Mojacar and Desert Springs (near Almanzora). The dry climate of the Costa Almeria region means that playing golf in sunshine is almost guaranteed. There are no shortage of excellent golf courses in this area. Many have been built as gigantic complexes with luxury hotels and housing (urbanisations) where you can virtually step out of your property onto the course itself. Notable golf courses include the Sercotel Valle Del Este golf resort which is a four-star hotel with spa, gym and sauna. Probably the best-known is Desert Springs which is another resort with hotel, the Indiana golf course and properties to buy ranging from apartments, townhouses to luxury villas all with access to beautiful communal gardens and pools. You don’t actually need to leave the resort but if you do the nearest town is the small market town of Cuevas de Almanzora and the nearest beaches are located in the pretty town of Villaricos. Throughout the region and province of Almeria there are many fixed cameras set up that transmit live images of Almeria. These web cameras are usually streaming live video and film and uploading it to Internet sites so that you can view these cams at any time of the day or night. Why would people want to view these webcams? Well the cameras are usually situated in some of the most scenic locations of Almeria so you get to see beaches and landmarks to see what Almeria is like as well as viewing the live weather conditions – handy if you are considering settting off to visit the locations. Almeria City Views – This webcam is situated in the north-east of the city and shows views over the rooftops of Almeria. The fabulous golf course of Desert Springs is featured on this live webcam from the Patio Andaluz of the Clubhouse looking across Powder Creek and the 18th Green to the Las Sierras village in the Cueves de Almanzora area. Costa Almeria Weather – Guide to the weather and climate in the various towns and cities on the Costa Almeria including today’s weather, tomorrow’s weather and forecasts ahead for 5 days, 7 days and 10 days. Abrucena Tourist Information – Abrucena is a municipality located at the northern edge of the Sierra Nevada in Spain’s Los Filabres which is 70 km north-west of Almeria. Adra Tourist Information – The beginning of the Costa Almeria this is a old fishing port and industrial town with a castle. Ten miles to the east is the Albuferas de Adra Natural Reserve which has three lakes and is a wetland with many species of aquatic birds here. Aguadulce Tourist Information – Aguadulce is a beach resort 11 km to the west of Almeria and very close to the airport. Further west comes the next beach resort of Roquetas de Mar. Albox Tourist Information – Albox is a fast-growing market town with a rising expat population. Albox is located in the heart of the Almanzora Valley in a picturesque area full of almond and olive groves. Almanzora Tourist Information – Almanzora is a small village growing in popularity with expats. It is close to Albox in the Almanzora Valley. The Desert Springs golf resort is near here. Almeria Tourist Information – Almeria is the capital of the province of Almería. The city is the gateway to the Costa Almeria due to its international airport. The city has a number of worthwhile tourist sights most notably the large Islamic fort called the Alcazaba and the cathedral. Almeria also has its own beach. Almerimar Tourist Information – Almerimar is located about 24 miles (40 km) west of Almeria, just off the main A7 coastal motorway. This purpose-built resort offers around seven miles of beaches and is mostly popular with Spanish tourists. Here you will find the Gary Player designed Almerimar golf course with the green of the 12th hole situated in the middle of a lake. Antas Tourist Information – Antas boasts a number of prehistoric settlements where the remains of people from the Neolithic, Bronze Age, Roman and Medieval times were found around the town. Arboleas Tourist Information – Arboleas is a small town in Spain’s Almanzora valley known for its long and interesting history. It has an agricultural economy and grows major crops such as barley, wheat, almond trees, olive oil and citrus. Bedar Tourist Information – Bedar is an authentic Spanish village that’s nestled at the foot of the Cabrera Mountains in Spain’s Sierra de Bedar. Located at around 15 km from the coast and the resort areas of Garrucha and Mojacar, Bedar is the perfect destination for anyone who wants to enjoy a rural holiday yet needs to stay near to the coast as well as to the amenities that it offers. Carboneras Tourist Information – Carboneras is located next to the Mediterranean Sea and has a large beach with a promenade lined with restaurants, cafes and bars. There are many fiestas such as Moors and Christians in June and Virgen del Carmen. Cuevas del Almanzora Tourist Information – Cuevas del Almanzora is an inland town with a long history. It is known for its artificial caves once inhabited by silver miners. The Castillo de Marques de los Velez houses an important art collection. Garrucha Tourist Information – Garrucha is a popular tourist destination due to its superb sandy beaches which draw tourists from all over Europe as well as Spain. Despite its growing popularity for tourism Garrucha remains a small resort which still retains its charm as a lively fishing port on the Costa de Almeria. Huércal Overa Tourist Information – The town of Huércal Overa has resulted from the joining togther of two smaller towns to form this main town of a thriving agricultural region just off the A-7/E-15 autoroute/motorway. Los Gallardos Tourist Information – The town of Los Gallardos is an inland destination that can be easily reached through the AP-7 motorway from Almeria. Mojácar Tourist Information – Mojácar on the Costa de Almeria is made up of two very different parts; the traditional hilltop village of Mojácar Pueblo and the modern coastal beach resort of Mojácar Playa. Mojácar is south of Garrucha. Nijar Tourist Information – Nijar is a small town 31 km to the north-east of Almeria and it produces much of the pottery and coloured rugs you will see on sale throughout the province – and beyond. 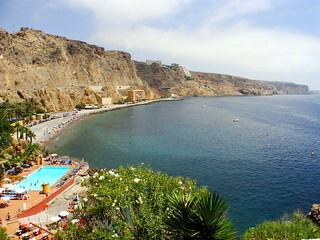 Roquetas de Mar Tourist Information – Roquetas de Mar is a popular beach resort to the west of Almeria. There are plenty of activities, attractions, trips and excursions you can do when you stay in Roquetas de Mar. There is golf at the Playa Serena Golf Club, the beaches are good and the climate is superb. Getting to Roquetas is easy as the Almeria International airport is only 25 km away via the A7 motorway. Between Roquetas de Mar and Almerimar is the Paraje Natural Punta Entinas-Sabinarare, this area of wetland is home to many species of birds and is a protected zone. San Jose Tourist Information – San Jose is a small beach resort to the east of the Cabo de Gata with some of Costa Almeria’s best beaches close by. San Juan de los Terreros Tourist Information – A good beach resort in the Andalucia region just below the border where the Costa Almeria meets the Murcia (Costa Calida) region. Stay in the two-star Hotel Calypso right on the beach or the La Venta hostel if you are on a budget. The sandy beach slopes gently into the sea so is ideal for families. You can’t miss the landmark castle, built as a fortress in 1764 on a headland stretching into the sea. Play golf at the Aguilon course nearby. Popular places to buy properties include Calas del Pinar or urbanisations such as del Crommelynck, Beverly Hills, Las Mimosas, Mediterranea, Costa Serena, Las Gaviotas and Bella Vista. Sorbas Tourist Information – Sorbas is a visually stunning village built on solid rock and seeming to cling onto the cliff face. The nearby Sorbas caves are the main attraction of the area. Turre Tourist Information – Turre is a scenic village located inland inbetween Mojacar on the coast and Los Gallardos and set on a hill amongst the Sierra Cabrera mountains. Velez-Blanco Tourist Information – In the very north of the Costa Almeria this town is in a scenic area with the backdrop being the Sierra de Maria mountain range rising to 2045 metres above sea level. Close by is the village of Velez-Rubio. Things to do – visit the stunning castle (Castillo de los Fajardo) and nearby pre-historic caves and paintings, listed by UNESCO World Heritage at Cueva de Los Letreros and La Cueva del Gabar. Vera Playa Tourist Information – The town of Vera is inland from the coast and has the Vera Bull Ring which is a historical bull fighting ring which still has fights. On the coast is the beach resort of Vera Playas. The water park of Parque Acuatico Vera is close by. Villaricos Tourist Information – Villaricos is a small and charming resort typically a mix of fishing village and beach resort north of Vera Playa. The surrounding scenery of the Sierra Almagrera mountains adds to the tourism appeal. Below is a really interesting tourist video on Costa Almeria. Page Summary – If you are visiting the Costa Almeria on holiday, if you live on the Costa Almeria or are thinking of moving to the Costa Almeria then we hope this Costa Almeria tourist information has been useful. Please help us to make this the number one tourist resource for Costa Almeria by adding any comments, reviews, ratings and feedback on any aspect of the Costa Almeria that you know about. We also welcome your photos, pictures and videos for posting on our website. I am Kristė Voraitė from Lithuania. I am quickly learn new things 20 years old lady. I am looking for a bartender/ waitress job . I was working as a shef assistant and stylist and have recomendations from my previous employers. I am fluent in English and know basics in Spanish. Please contact me at kristevoraite@gmail.com.,phone:+37062962107 or facebook: Kristė Voraitė.